Can't believe it is almost the end of February. Life has been a little crazy so far this year. To start with on January 10th our second grandson was born. Charles David Cook. Dave and I flew to California for a week to spend time with Jamie and her family and to help out. It was a great visit. On January 19th my sweet Grandmother passed away at 102 years old. What an amazing life she lived and I am so proud to have had my grandmother for 47 years. I miss her. We all celebrated her life and talked all about the memories we had of Grandmom. At the end of the night we lit lanterns. Charlie at one month. He looks just like his mama. Such a cutie! Robert will turn 20 next month. How can that be?! He's finishing up his sophomore year at Arizona State. Dave and I are so proud of him. We had him custom fitted for a suit. He his currently applying for an ASU Police Aide position. He passed the written and physical test. Had his oral board interview this past Monday and will find out if he advances to the polygraph test within a week. More pics from July 28th. 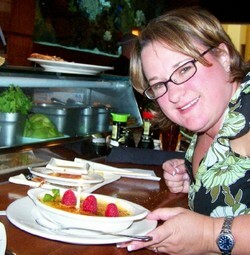 We had lunch at Kona Grill. That was fun! I thought wabasi was avocado. We it's not and it's SPICY! 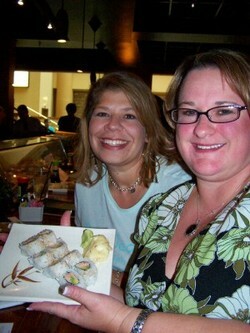 Sonja and I with our sushi. I know it's Monday, but I haven't posted in about a week so I thought I'd backtrack to where my weekend started. Thursday night my friend, Sarah from Utah flew in for a long weekend. Friday was my birthday and 5 of us went out for the day. What a total fun day we had! Then we went and got pedicures. Drove over to Scottsdale Fashion Square where we were on a mission to the Tiffany's store. Went to a bunch of cool stores. I went a little crazy in Crate and Barrel. 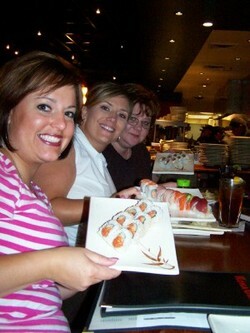 We had sushi at Kona Grill. 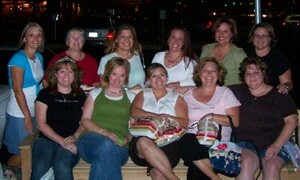 That night the whole gang met at Cheesecake Factory for dinner and we had our card swap. 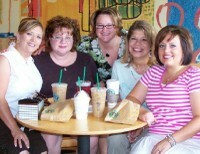 Then we went to see "The Devil Wears Prada" at the movies. 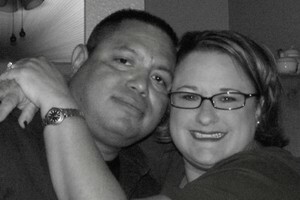 Dave and I celebrated our 13 year anniversary today. 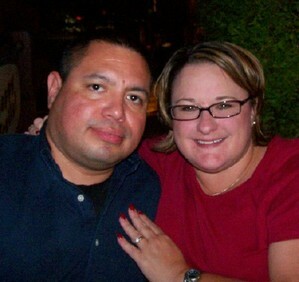 We went out to dinner to Cattlemen's. We loved going there when we lived in No. Ca and now they have one here in Peoria. Robert took a bunch of pictures of us. Here's a couple of them.